Keith Lockhart, center, conducts The Boston Pops orchestra during rehearsal for the annual Boston Pops Fireworks Spectacular on the Esplanade, July 3, 2017, in Boston, Massachusetts. Americans are observing Independence Day, a federal holiday marking the United States' independence from Britain. As millions of people celebrate America's 241st birthday throughout the U.S. with traditional fireworks displays parades, concerts, cookouts and other activities, law enforcement agencies are taking new and traditional approaches to keep celebrants safe. In the northeastern city of Boston, Massachusetts, where the American Revolutionary War began, police are deploying a tethered drone for the first time to capture aerial views of the 500,000 people who are expected to gather for the city's fireworks display. New York City police are placing dozens of sand-filled trucks near popular viewing sites during its fireworks show and other events. Officials say the trucks are being deployed in response to the Bastille Day massacre last July, when 86 people were killed by a terrorist who plowed a truck into a crowd during a fireworks show in Nice, France. In Washington, authorities are also preparing for vehicle-related attacks during the National Independence Day Parade, the Smithsonian Folk Life Festival and a fireworks show on the National Mall. The National Park Service has placed large fences around the Mall and established security checkpoints for people entering the area. President Donald Trump celebrates the holiday by hosting a cookout for military families, followed by a viewing of the fireworks show for the families and White House staffers. Trump wished holiday revelers well with a tweet Tuesday that included a video of a new worship song that was named after his campaign slogan, "Make America Great Again." The song premiered at a Washington evangelical Christian rally Saturday that was co-sponsored by the First Baptist Church of Dallas, a mega church pastored by Robert Jeffress, a staunch supporter of the president. Trump praised the church choir that sang the song, saying "Your music honors our heroes more than words will ever do." But the song was criticized by Jonathan Aigner, Director of Music Ministries in a Presbyterian Church USA congregation. "Pledging allegiance to God and to America in the same breath, melding together the kingdom of God and self, they pray blasphemous prayer to a red, white, and blue Jesus," Aigner wrote in a blog post. The July 4th celebration takes on new meaning for nearly 15,000 immigrants. They will be sworn in as new citizens in more than 65 naturalization ceremonies across the country, a reminder the country has attracted immigrants since its inception. The ceremonies come at a difficult time for those who want to immigrate, as the Trump administration institutes a scaled-back partial travel ban that places new restrictions on citizens of six Muslim-majority countries who want to enter the U.S.
A record number of people are traveling to commemorate the holiday this year. More than 44 million Americans are traveling at least 50 miles from their homes between Friday and Tuesday, according to the American Automobile Association. 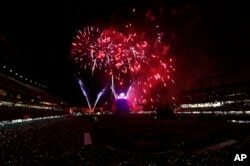 Fireworks explode over Coors Field to mark the Independence Day holiday after the Colorado Rockies hosted the Cincinnati Reds in a baseball game, July 3, 2017, in Denve, Colorado. On July 4, 1776, representatives of the 13 American colonies officially adopted the Declaration of Independence announcing the severing of ties with Britain. The rebellion began the previous year and would continue until the United States and Britain signed the Treaty of Paris in 1783, which formally recognized the independence of the United States of America. Although the Declaration of Independence states, "We hold these truths to be self-evident, that all men are created equal, that they are endowed by their creator with certain inalienable rights, that among these are life, liberty and the pursuit of happiness" the document was drafted by Thomas Jefferson, a slave owner who later became the third U.S. president. Jefferson was not the only slave owner to sign the document. About one-third of the signers of the Declaration of Independence, from the north and the south, owned or had owned slaves. George Washington, who also signed the decree and later became the country's first president, owned nearly 125 slaves, whom he freed in his will. John Adams, the second president and Washington's vice president, did not own slaves and supported a gradual process of abolishing slavery. Slavery in the United States was not outlawed until the Civil War ended nearly 80 years after the signing of the Declaration of Independence.